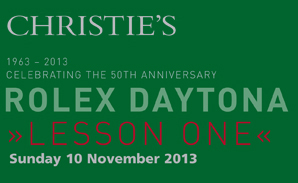 This sunday Christie’s had a special auction celebrating the anniversary of the uber famous Rolex Daytona. They collected 50 prime examples ranging from early models and Paul Newman dials to modern contemporary exotics such as the Daytona beach. Sale prices all hit the sky and set many records for Rolex and the Daytona model. I don’t know if this is good or bad for the market.. I guess we will see but one thing is for sure: whoever sits on a vintage mint Daytona will ask a crazy price! 50 Rolex Daytonas sold for over $13,000,000 bringing the average price to $264000! And most of them stainless steel!